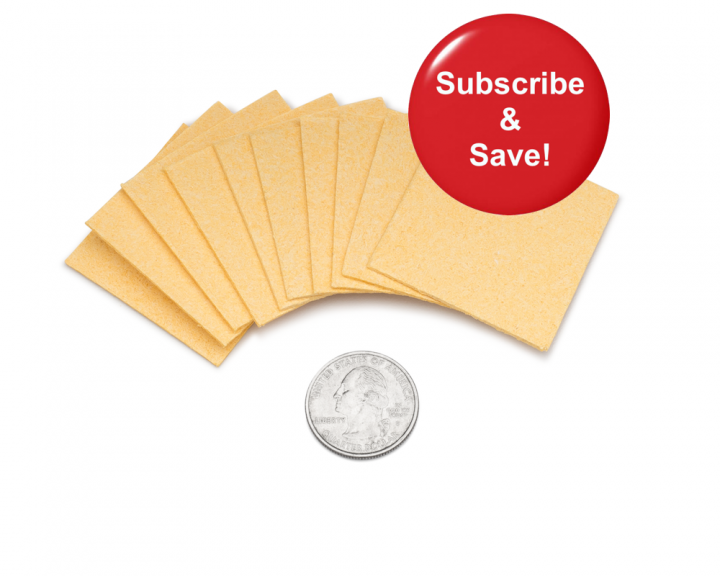 With our new subscription plan you’ll never have to worry about running out of fresh electrode sponges! Over time, electrode sponges lose their integrity, leading to uneven current distribution and less effective tDCS sessions. In addition, using degraded sponges can sometimes cause tingling or itching sensations, especially during the start and end of tDCS sessions. We usually recommend that electrode sponges be replaced every two weeks, or once every seven tDCS sessions. However, the best results can be obtained by using fresh sponges for each session. These 3×3″ sponge inserts are used to replace the original sponges that come within our 2×2″ Amrex Sponge Electrodes. In addition, these sponges will serve as replacements for the one’s included in our Basic tDCS Kit. We believe it is best to replace tDCS electrode sponges every two weeks, or every 7 tDCS sessions. However, the best results can be obtained by using new sponges for every session.